This spring I am taking part in a book study of A Place I Didn’t Belong: Hope for Adoptive Moms by Paula Freeman. I am admittedly so far behind the study schedule. I was doing another study at the same time and didn’t anticipate the “work” this book would entail. I thought the book would simply contain stories of other adoptive moms (which it does) and discuss the good, bad, and ugly of the adoption journey (which it also does), and our group would discuss the chapters. What I didn’t realize was the emotional work the book requires. Each day there are questions to answer that make adoptive moms analyze and reflect upon their journey. This is so important, and I need to make sure I give it the time it deserves! 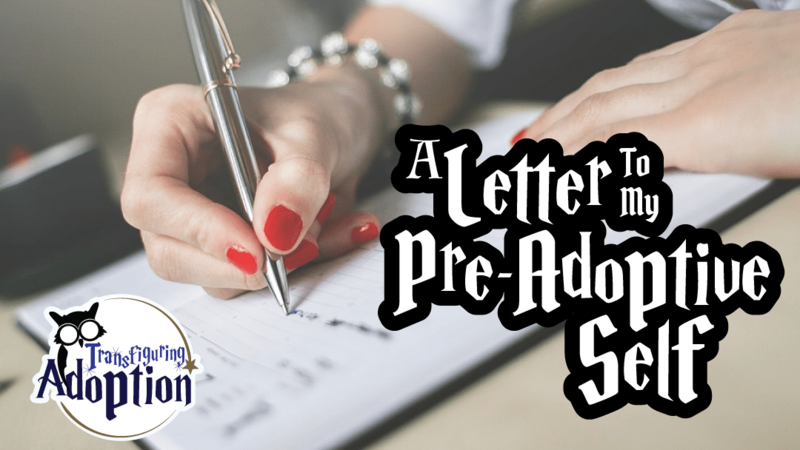 One of the questions I recently answered called upon readers to reflect upon who they were before beginning the adoption process and then instructed us to write a letter to our pre-adoptive selves. What would I like to tell myself? Wow! What should I tell myself? Should I tell myself to make different decisions about the children who are now ours? If I knew then what I know now, would I make the same decisions? That is such a hard question to answer and one adoptive parents often avoid or are afraid to admit their answers out loud. The hard parts of adoption are buried deep in all the people involved as they hear stories about the miracle of adoption. Parents, kids, and biological families fear being condemned for expressing the hurt and all the negative emotions that mingle with the positive joys. Just the other day I affirmed another adoptive mom and let her know she is not the only one struggling through. So What Did I Decide to Tell Myself? You are so patient, kind, and compassionate. You are fun, intelligent, and talented. You have a huge heart to help those in need. This journey will turn you into someone you don’t recognize and whom you really don’t like. You are going to take on so much more than you realize. For the first six months or so, things will seem good. The following 6.5 years will be unbelievably hard. You should really have had so much more training and understanding in the beginning. There are great books, DVDs, and conferences you won’t find for a couple years that you’ll wish you’d known about from the beginning. Reality will be so different than any expectations you may have of what your future family will look like. You will need to mourn. You will need to forgive yourself, move forward, and forgive yourself again. A review of this book will be coming when I finish it! 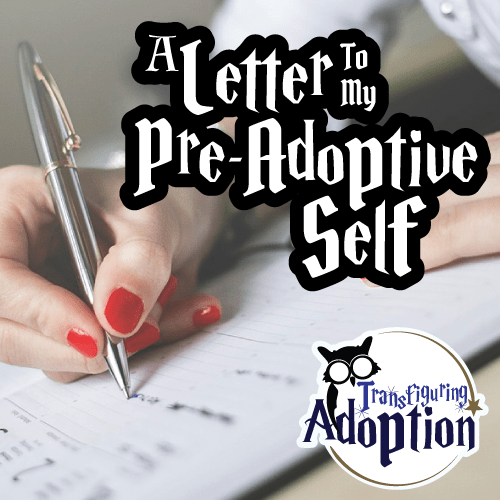 What would you tell your pre-adoptive self? What do you need to mourn? What are you afraid to share with others? what an interesting question! My preadoptive self was very similar to you and my post adoptive self isn’t someone I always like! It is an interesting question! At first glance, it seemed easy enough, and then when I really started to think about it, I didn’t know what I should tell myself. I think looking back at who we were and why we started this journey has the potential to either make us feel sad about who we’ve become and what our realities are or give us strength (or both). We need to give ourselves permission to own those feelings, mourn, and move on to finish the journey strong! How do you handle that difference in who you are now compared to who you were before adopting? What has helped you?